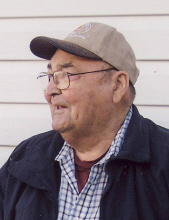 On Wednesday, February 6, 2019 Mr. Harry Krinbill of Edgerton, Alberta passed away at the University of Alberta Hospital, Edmonton, Alberta at the age of 89 years. Harry is survived by his loving family; three daughters, Loretta Krinbill, Marjorie Krinbill, Peggy Johnson; one son, Barry (Bobbi) Krinbill; daughter-in-law Gloria Krinbill; grandchildren, Jennifer (Cody) Coutre and their children, Shynee, Autumn and Marley, Lisa (Tyler) Dicker and their son, Porter, Jesse Johnson, Michael (Glenna) Krinbill and their children, Mikayla, Michael and Mathea, Dennis (Zofia) Krinbill and their children, Brandon, Conner and Logan, Mckenna Krinbill, Isaac Krinbill; granddaughter-in-law Heather and children Dakota and Hayden. He was predeceased by his wife, Hazel; one son, Ray Krinbill; one grandson, Cory Krinbill. A funeral service for Harry will be conducted on Tuesday, February 12, 2019 at 11:00 AM from the Edgerton Agricultural Hall with Reverend Ann Marie Nicklin officiating. Interment will follow at a later date in the Edgerton Cemetery. If so desired the family suggests memorial contributions be made to the charity of the donors choice. "Email Address" would like to share the life celebration of Harry Joseph Krinbill. Click on the "link" to go to share a favorite memory or leave a condolence message for the family.